Theatres are prone to pests. They are high traffic. They have dark areas that make it easy to hide. There is often spilled food to feed upon, stationary guests to bite, and plenty of space to explore. 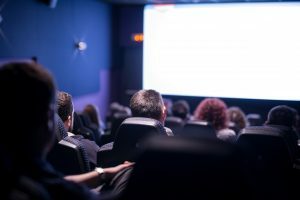 Movie theatres, concert halls, all other types of video and performance venues have this problem, which is why it is very important to partner with a commercial pest control company that understands the needs of these large, spacious buildings. In Vancouver, Richmond, Whistler, Coquitlam, and most of British Columbia, that partner is Local Pest – Canada’s leading pest management service. Call 778-828-6094 today for a free quote. Bed Bugs – Theatres are one of the few commercial properties that can serve as a potential infestation spot for bedbugs, because it offers plenty of hiding spots, stationary people that sometimes fall asleep, and heavy foot traffic which brings an increased risk of multiple bedbugs invading. Rats and Mice – With a lot of spilled, sugary foods all over the movie theatre, rats can be a common problem in theatres. The darkness lets them move around with ease, and the easy access to entrance spots make them prime invaders. Roaches – Roaches invade any type of property, and may be especially interested in the smell of old theatres and the easy access to food. Ants, birds, spiders, and more – nearly all types of pests are attracted to movie theatres, concert halls, and other performance venues. At Local Pest, we want to be there to help make sure that your theatre is pest free and your customers are satisfied with their experience. Vancouver, White Rock, Maple Ridge, Burnaby, Coquitlam, Richmond, and more – we serve most of BC and are available to prevent and eliminate the pests that most affect your business, with affordable rates, friendly service, and technologically advanced treatment options that are safe for all of your guests. Contact us today at 778-828-6094, or fill out the form below for a no obligation quote for our services.